Challenge your dog to a mental game and strengthen their logical thinking! 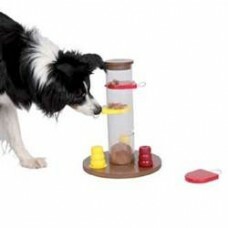 PetHangout is excited to offer the Dog Activity Gambling Tower – L1 from our Puzzle Collection. This is no ordinary dog toy for sure. An introductory level for beginners. It will challenge your pet to tug on the ropes to reveal their prize. You can also hide treats in 3 base cones that will offer additional engagement. You will enjoy watching your dog “think” through” this game. PetHangout has other engaging puzzles to challenge your dog: check out the Push Away and the Gamble Box. Got Questions? Email us at contactus@pethangout.com or call - 877.860.1278 We can help!